B9Creations, a global leader in high-resolution 3D printing, releases the new B9 Core Series, a 3D printing solution engineered to be the new industry leader in production, speed and simplicity. 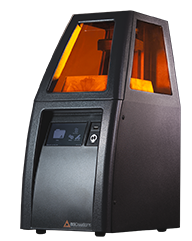 Rapid City, SD, January 20, 2017 – B9Creations, a global leader in high-resolution 3D printing, releases the new B9 Core Series, a 3D printing solution engineered to be the new industry leader in production, speed, and simplicity. Combining an industrial HD LED light engine with patented and patent-pending technology, the B9 Core Series prints faster than machines costing 3 times as much without sacrificing the most intricate design details. Design iterations can be brought to life over lunch, not overnight. B9Creations lives out this commitment by keeping operating costs low, including software with the machine, not requiring maintenance contracts, and including factory startup assistance with every Core Series sold. “The look is new and the company has grown, or passion remains the same – making highresolution 3D printing technology work for your business,” said Founder and CTO, Mike Joyce. B9Creations was the first company to combine high-resolution and affordability in the 3D printing industry and is once again redefining expectations.